Looking for a new home can be such an exciting thing to do. Whether you’re looking for your first home, a larger home for your growing home, or downsizing for retirement; the home buying and building process is thrilling. So, when looking for a new home, is it better to buy an existing home or build a new one? When you build a home, from the start of breaking ground to the time you move in, will be longer than if you are simply buying an existing house. However, when you build a house, whatever you desire to have in your home, you can have. This customization factor is a huge draw for those who ultimately decide to build a home. The design and floorplan are exactly how you’d like them. You’ll get exactly the number of bedrooms and bathrooms that you want. Finishes like marble countertops jetted tubs, or even landscape, if it’s within budget and accessible, can be yours. The condition of the home will also be better compared to a preexisting house. Ninety-nine percent of the time the structure of the home built in the 1950s will have more issues than a home built in 2018. It’s also hard to get a sense of what’s behind the walls of a 1950s home. Electrical problems, asbestos, lead paint, or even mold can all be existing in an older preexisting home without the knowledge of it being there. In comparison, a newly built home will have brand new electric wiring, and no asbestos, lead paint, or mold. When your custom-built home is completed, you can rest easy knowing that there are no health concerns with your new house. When buying a home, there are two distinct advantages, convenience and cost. Once you’ve been approved for a home loan, you can begin shopping for homes, probably with a realtor or real estate agent. Once you’ve decided on a home to buy and you purchase that home, it usually takes about a month or two to move in. By having a realtor or real estate agent assist you with the home buying process, it’s a much more hands-off approach compared to building a home. So, not only is the timeframe shorter, but it’s can also be a less involved process, for those who have busy schedules, or are in a pinch to move somewhat quickly. In many, not all cases, buying also typically costs less than building. There are plenty of mortgage calculators online that will predict your monthly payment from a fixed purchase price. Generally speaking, that price will never change dramatically, and should be about what you would pay for the duration of your loan. When building a home, price fluctuations can happen, but are typically a result of a change or materials at the request of the homeowner. Which is Better, Building or Buying? Buying a preexisting home certainly has its benefits, but so does having a custom home built. In terms of which is better, it all depends on the person who is looking to move. If you need a home that’s economically priced and are in need to move in a short period of time, buying is probably the better option. If you have time and are willing to put in a little extra effort to get exactly what you want, then building a home is the way to go. It all boils down to whichever works best for you. 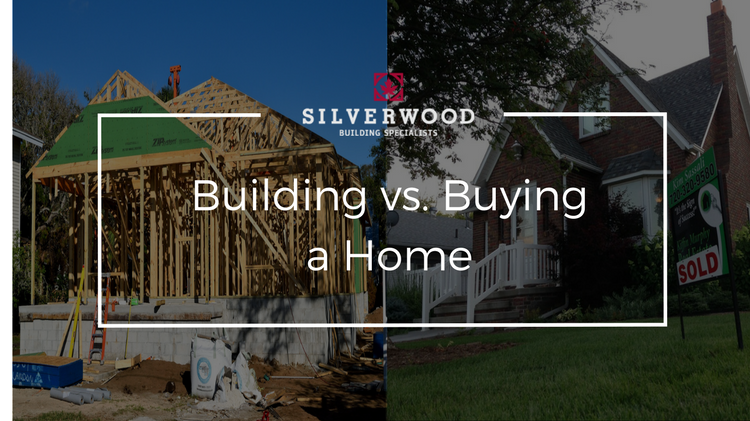 If you do decide to go the route of building a custom home, consider the building specialist at Silverwood Enterprises. We specialize in custom home building from a distance. That means even if you’re across the country, we are still able to work together closely on building your dream home in the Traverse City area. Our internal processes make the home building process simpler than with other home builders, even if your busy or remote. With over 100 completed projects on Old Mission Peninsula alone, we have the expertise and experience to turn your dream into a reality. Contact us today, and see why we’ve been building dreams for over 35 years. Before you build a custom home, do this first.